Today’s Disney Princess Manicure is based on Princess Ariel, the sassy-but-scaly star of the Little Mermaid! 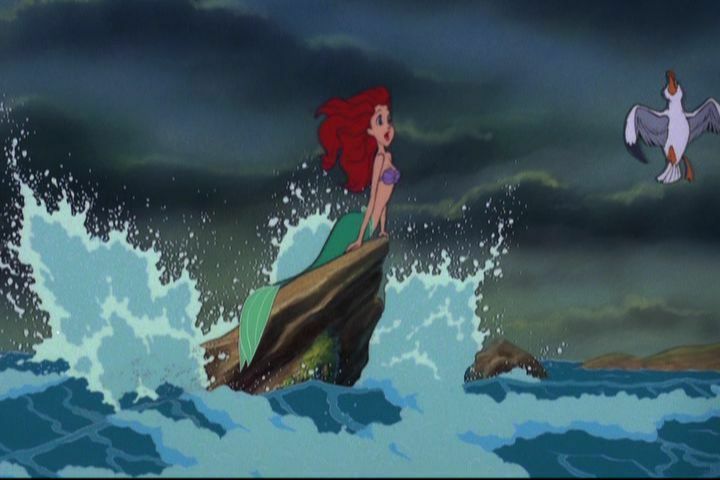 This Little Mermaid’s polish scheme is based on her flaming red hair and shimmery green tail. 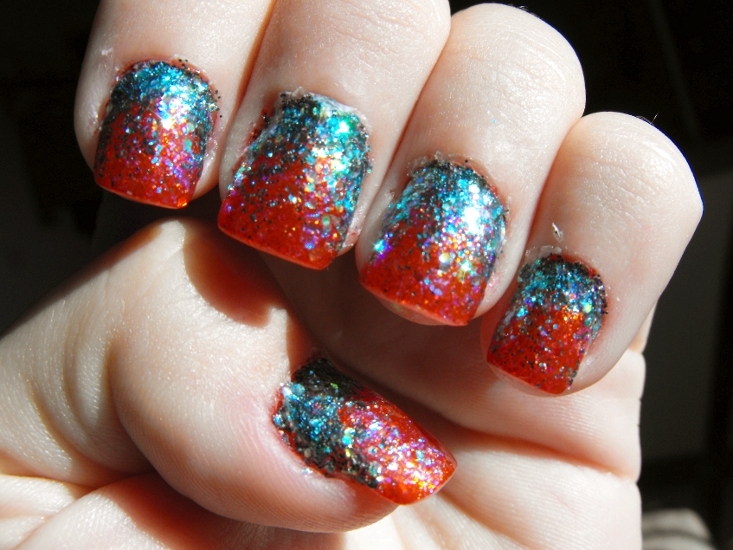 I used Hard Candy Lava as a base. 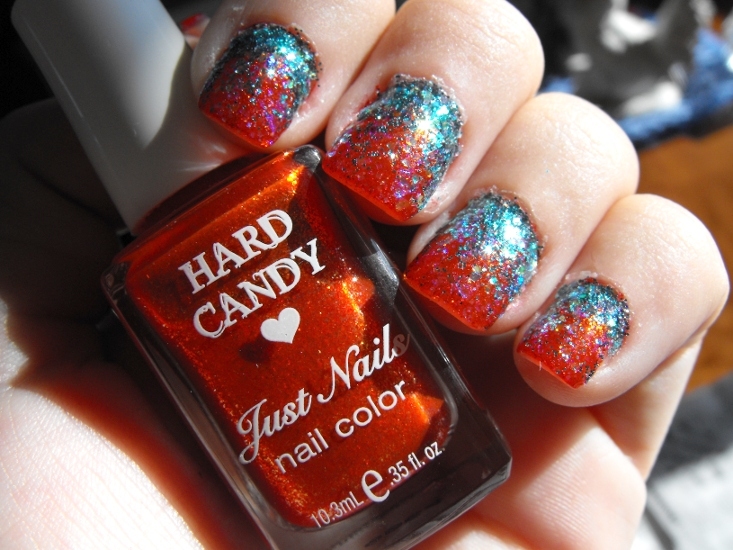 Hard Candy, as you probably know, relaunched sometime recently with a Wal Mart exclusive cosmetics line. They’re nothing like they used to be (look at these old Hard Candy polish links if you want to be depressed for the rest of your life), but they have some stellar shades. 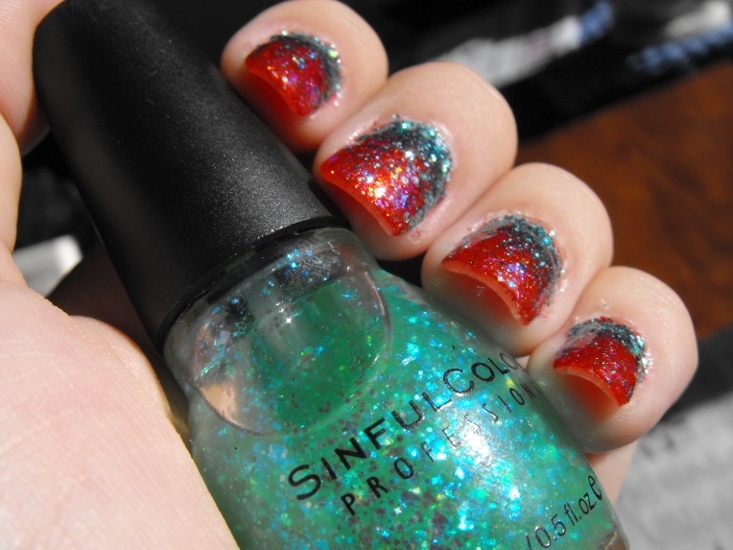 I put a coat of Sinful Green Ocean over the red because it looks like an ocean in a bottle, with big iridescent flakes that flash purple like Ariel’s classic shell bra. Sinful Colors aren’t universally loved – some people really hate the formula but I personally think they’re great. You can pick them up for very cheap at drugstores, they have a fantastic range of colors, and apart from the occasional dud bottle I think they go on fine. Certainly not any worse than most other major polish brands. 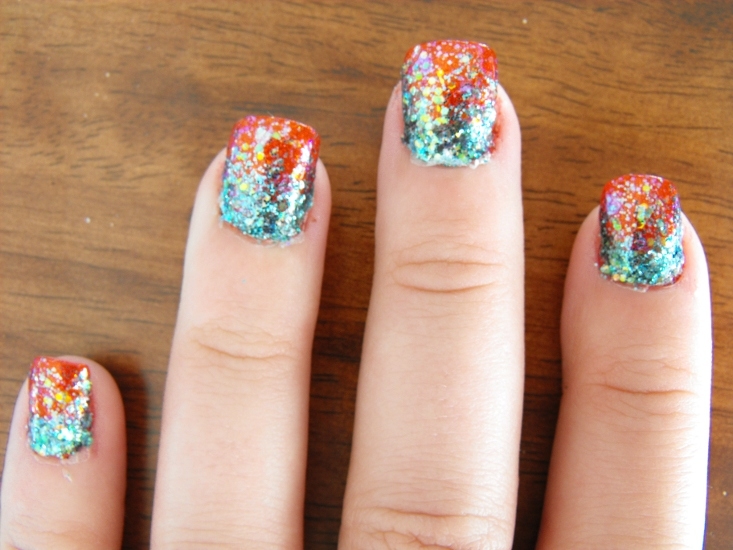 For the mermaid tail-look, I used Splash Nail Art Glitter in Tropic Teal. 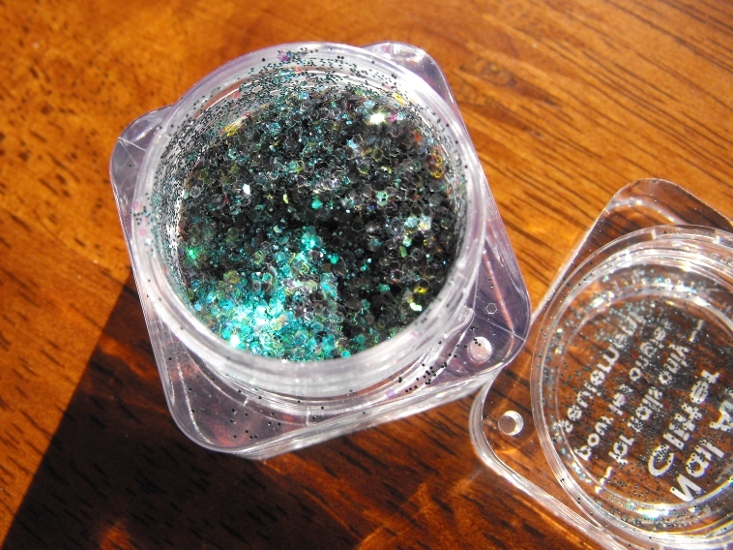 This loose glitter combines small teal glitter pieces and larger green iridescent hex glitter. I love that the bigger iridescent pieces almost look like fish scales! I applied this loose glitter by taking the cheapest of my clear top coats (it doesn’t matter which; you’re just using it as a binder) and dipping it into the glitter pot. A little goes a long way! I put the glitter on the base of my nail and then basically just pushed it around the edges and brushed upward to achieve an ombre effect. I’ve already gotten quite a few compliments on this manicure – it’s one of those paint jobs that does amazing things in real life. The glitter is crazy, kinda like our girl Ariel! That's what you get for listening to a talking sea gull. 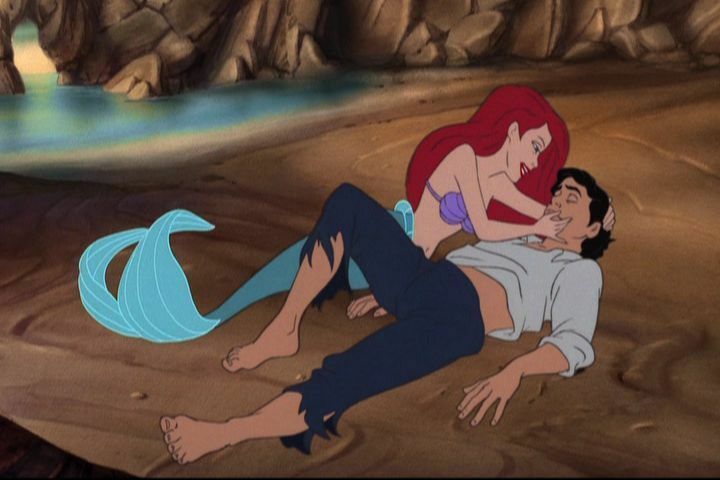 Momentary nostalgia: If I had a dime for how many times I tried that “bursting out of the water and tossing your hair over your head” thing while swimming, I’d be able to buy King Triton’s castle. Any girl from my generation that says she didn’t do it, too, is lying. 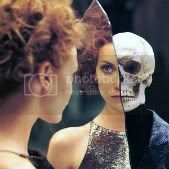 Oh, and don't forget: it's okay to sell your mortal soul to a cephalopodian witch in order to be with a man that has so little in common with you that aren't even classified as the same species. Thanks, Disney! 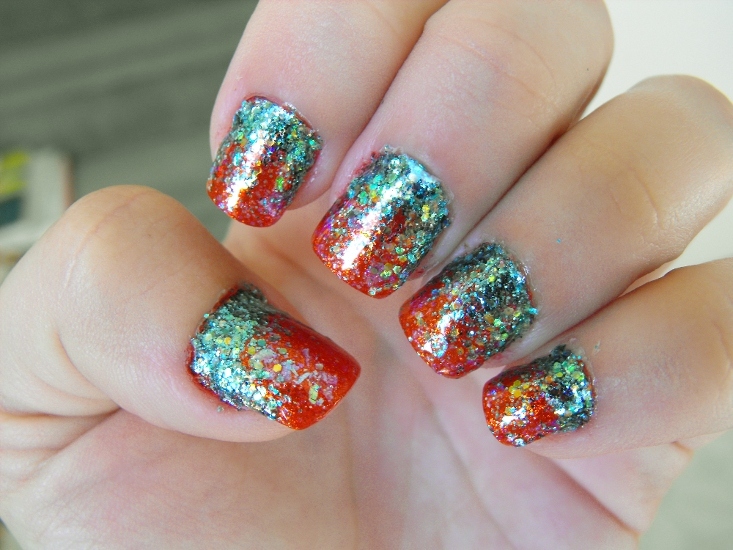 This entry was posted in disney princess, hard candy, nail polish, splash and tagged ariel, disney princess, little mermaid, manicure, nail polish. Bookmark the permalink. That Seche Vite top coat tip has changed. my. life. 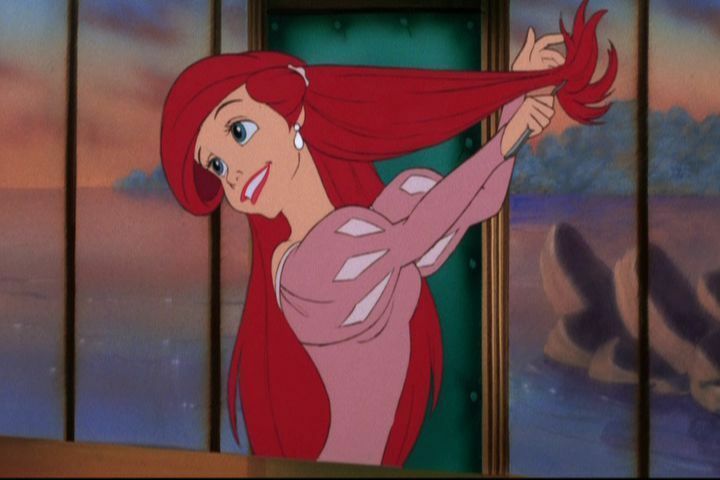 Also, I’m STILL trying the whole “bursting out of the water and tossing your hair over your head” thing.